New Zealand has a pretty benign fauna. We have no snakes, no carnivorous mammals bigger than our little bats and, ever since Haast’s Eagle was the driven to extinction, the apex of our natural food webs has been occupied by the karearea. The karearea is the native falcon, and a fierce predator, but it holds no threat to humans. In fact, we only have one native animal capable of doing people any harm, a venomous spider known as the katipÅ. So, some people were a little surprised to hear the katipo had been added to list of “absolutely protected” animals included in the wildlife act, the same level or protection offered to kiwis and the tuatara. The katipÅ’s name is a testament to the punch its bite packs, it translates as “night stinger”. Actually, the fact the species has a mÄori name at all sets it apart from our other spider species, the rest of them fall under the name pÅ«ngÄwerewere. The katipÅ certainly deserves special recognition, it’s a cousin to the black widow and the redback and its neurotoxic venom can produce the same suite of symptoms that make those spiders feared the world over. Although the katipÅ’s bite is excruciatingly painful, the spider’s unique ecology means they seldom bite humans. The katipÅ is very closely related to the Australian redback (the two can still hybridise) but whereas the Australian species is a generalist that lives in amongst rocks and logs and human debris, the katipÅ has become a specialist. It builds its web in driftwood and grass on sand dunes. That specialised lifestyle has been the katipÅ’s undoing. In the last hundred years the total area of sand dunes in New Zealand’s coastline has decreased by 70%. Not only has most of the katipÅ’s habitat been destroyed in the last hundred years, most of the the remainder has been degraded. We introduced marram grass to sure up dunes that have been disturbed by agricultural and urban development. While that grass does a great job of collecting sand and holding up dunes, it’s also very invasive and the katipÅ doesn’t much care for it (preferring the relatively sparse growing native sedge pingao). Marram grass isn’t the only invasive species driving the katipÅ’s decline, a distantly related South African spider called Steatoda capensis has become widespread in New Zealand. S. capensis is another generalist which has not trouble getting by in marram filled dunes and breeds more quickly than the katipÅ. Add the damage done by recreational activities like quad bike riding to the pressures already listed and you start to realise why there are eight populations of katipÅ left it the South Island. There is no doubt that the katipÅ is threatened with extinction. Adding it to the list of species protected under the Wildlife Act* gives DoC the ability to post scary sounding warnings around remaining habitat, and to prosecute people who willfully damage that habitat. But it’s clear from a few comments around the web that not everyone is on board with saving the katipÅ. Why should we try and hold on to our only dangerous animal? The risk posed by the katipÅ is really infinitesimal, they aren’t living on your downpipes or your living rooms. Even if you wander into the sand dunes you’ll have to go out of your way to find a katipÅ and get it scared enough to bite you. New Zealand’s biota is already so depleted by human enduced extinctions, it really would be shamefull to lose another species because of ill informed fear. * Reading the actual law really does my head in, I think it means for the purposes of that act terrestrial vertebrates are protected unless other wise noted, and inverts are not unless specially picked out. And a wee note for all the spineless fans (there are some, right?.. ), next Sunday I will be in a series of airports on my way to the USA for the Evolution meetings in Portland. So, Sunday Spinelessness will take a break ’till early July. Yes, that’s correct. Under the Wildlife Act 1963, invertebrates are *not* animals unless they are specifically listed. The katipo now joins the Nelson cave spider as the only 2 arachnids on the list. It’s a little difficult seeing how the Wildlife Act will actually help, as the threats to the katipo really aren’t excessive hunting or harvest by people. Plus I think it is sad that irrational fears about spiders and ignorance about the threat it poses, should be a basis for so much anti-katipo sentiment. Yeah, I don’t think rangers will stopping too many katipo poachers as a result of this. I guess it does let DoC warn people they face big fines (which would never eventuate, but that’s another story) for disrupting the remaining populations. And it really is sad to see (only a few) people react so strangely to protecting a creature they’ll likely never see let alone be bitten by. Were there katipos in New Zealand prior to European migration here? 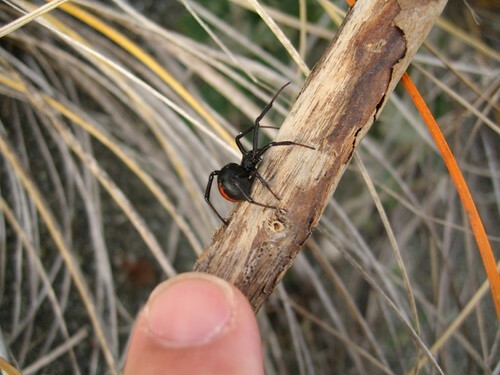 Some scientists have questioned whether the redback is really native to Australia, or is just a Black Widow population, introduced from North America, with a bit of genetic drift moving their red markings from ventral to dorsal. It does seem a bit strange that spiders of the species Latrodectus hasselti should be found on both sides of the Pacific. The redback is in its own species (the black widow is L. mactans). Apparently they weren’t widespread before European settlement, but it’s likely they are so much more common now because that settlement produce a lot more habitat for them. It was my understanding that the redback is L.mactans var. hasselti. Did that change? It did. The katipo and the redback are each others closest relatives and all the North and South American species come out together as the next closest group. Latrodectus spiders are sort of pre-adapted to long range dispersal because a lot of them balloon as spiderlings and they are capable of end up in the jetstream.